Mr Nifty and I are desperate to move to the sea, but the property market isn't exactly buoyant right now. So while we're waiting for that elusive house-buyer, we have lots and lots of days out. 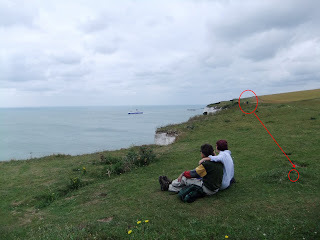 Today we walked along the cliffs at St Margarets Bay, just along from the famous white cliffs of Dover. not many people about - but while we picnicked, the people in the distance approached and sat down close enough to touch. WHY?!?!?!?!?! See all that empty countryside? What's so special about where we're sitting? As I say - we're people magnets. It's odd though, isn't it? Same thing happened recently when we went to an empty sandy beach - it was really hot so we put up our little sunshade tent and were sitting quietly in it - along came a group of teens and sat almost touching the tent! Goodbye quiet - the air was full of "So I went...and she was like... and whatever!" I never understand why people do that - when it's crowded fair enough but really?